You know that person (or people) in your life that literally don’t need a darn thing? Have you ever thought about gifting them an experience instead of another candle/throw blanket/knick knack thing they’ll never use? This year Dustin and I are gifting each other a couple nights in Chicago and I am so excited to do that with him! I’ve got some “experience” ideas that will take your gift giving to the next level. Plus, if you’ve waited until the last minute, these can be printed off and wrapper up after you confirm your order online. You’re welcome. If you follow me on Instagram, you probably saw that I have been to the Charlotte location of The Candle Bar twice in a month. 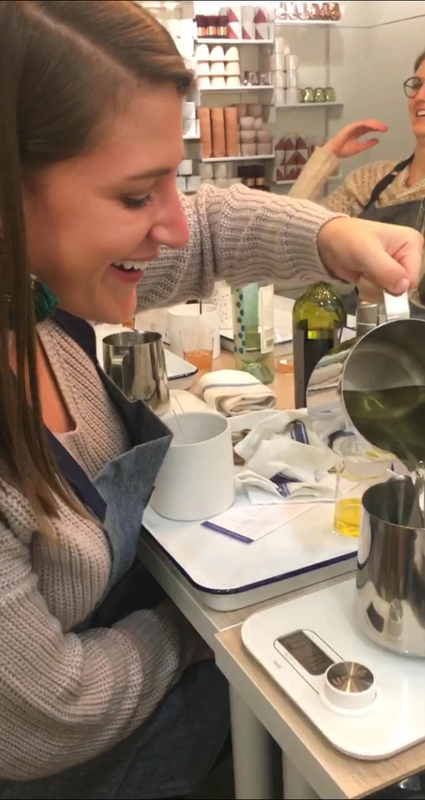 This company offers candle making classes where you choose the vessel the candle is in, the scent, and then actually pour the wax of your own candle. It’s super fun and only $35! While I was taking my second class last week with work friends multiple people came in to buy gift cards and I thought it was the best idea! Last year Dustin gave me tickets to see the Eagles in DC and it was such a fun surprise! We had talked about seeing them forever and I didn’t suspect it for Christmas at all. In Charlotte there are always Broadway plays coming to town and tons of musical artists. Tickets to an event are a fun surprise the day you gift them and the day you get to use them! My sister in law gave Dustin and I a cooking class for our wedding and it was one of our most memorable gifts. Tons of restaurants and stores offer classes, so maybe gear it towards a favorite cuisine or type of meal. It’s a fun, interactive gift that also involves good food and that’s a win in my book. To some people this may seem offensive, but I would love if someone wanted to pay for me to workout for a few months. This is something that is not only beneficial to someone’s health, but it can be an encouragement to try a new class or new type of workout. There is something about receiving the gift of a massage that has me excited every day until I get the massage. I have given Dustin multiple couples’ massages over the years and it may seem like kind of a selfish gift because I benefit from it too, but hey, then we’re both nice and relaxed after. I hope these gifts are helpful if you’re stuck on what to get someone! You’ll love the reaction you get when you open it and, if you’re lucky, maybe they’ll take you along with them to redeem it!